The Bricsys 24/7 collaborative cloud features an app that will assist you with project file management tasks. The Transfer Tool is a local desktop application that helps you transfer documents, folders or a complete folder structure between your local PC and the Bricsys 24/7 cloud. This split screen user interface let you upload or download files via drag-and-drop. Using the Transfer Tool, you can also set up local file open and edit functionality. This lets you choose which file to open – the local or the cloud copy – when you double-click a file in 24/7. 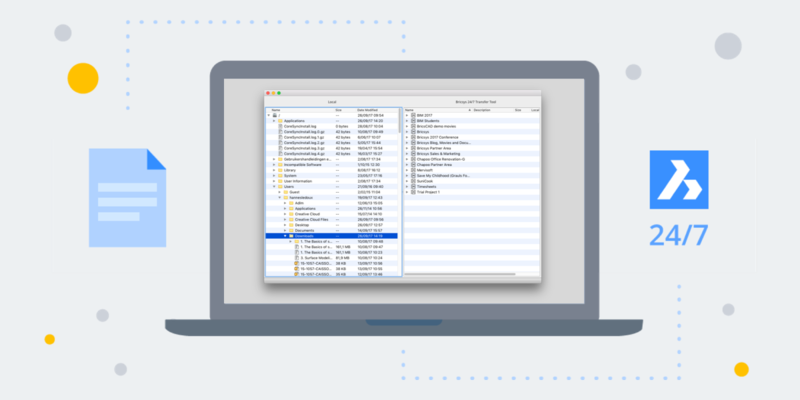 The transfer tool runs on your PC, and features a split screen user interface that lets you easily drag-and-drop files to move them to & from Bricsys 24/7. Don’t want to manually recreate your local drive’s folder structure in 24/7? The Transfer Tool takes care of this process for you. Just drag-and-drop an entire top-level folder (or sub-directories with additional folder structures) into the tool. It will automatically recreate the exact folder structure on the Bricsys 24/7 cloud servers. The Transfer Tool lets you download and view your project files on your laptop or mobile device. Just drag-and-drop from the 24/7 side of the Transfer tool window to download a folder (or a complete folder structure) to your local machine. Bricsys 24/7 supports more than 70 document types, from text to image to office formats. Bricsys 24/7 also understands CAD files and reference file dependencies. Need to make a quick change to a project document? The Transfer Tool lets you open a document stored in the Bricsys 24/7 cloud, directly on your device for fast editing. Save your changes, and the Transfer tool will upload your changes to the cloud and create a new file revision for tracking. If you use Bricsys 24/7, you’ll want the Transfer Tool today! To get Bricsys 24/7 Transfer tool, just download it here.